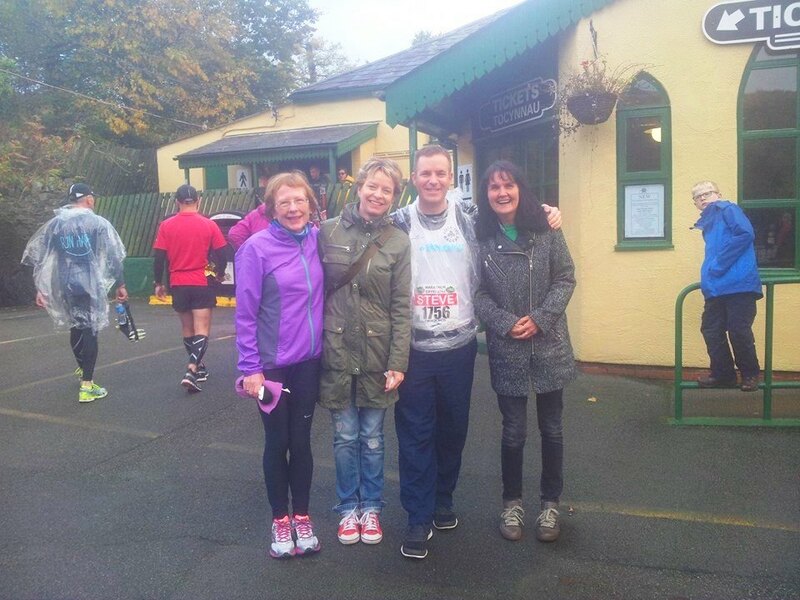 Snowdonia Marathon is a favourite among those BVRs who have done it. It could be the breathtaking scenery, the sense of achievement, or the tea and biscuits served by the W.I. at the finish. 2014’s event saw the biggest BVR presence since 2008 (when Belle Vue’s Alison Sedman became the first lady to win it three times). A few of us met up for pre-race photos, joined by loyal supporters Cecilia, Jim, Sue and Anne, before heading to the start. The forecast of sunny spells did not materialise, the heavens opened but, thankfully, it was not the horizontal rain we had in 2008. After a flattish descent, the first main challenge of the race is the 4 mile ascent up Pen y Pas. Alison got there first in 36:18, closely followed by Nigel Sedman, then Annie Hirsch. Andy Wood and Steve Webb ran the first 6 miles together. Steve caught Annie up at the end of the trail descent to Llyn Gwynant. They ran together for 7 miles, crossing the halfway point to see Sue, Anne and Cecilia in Beddgelert before Annie sped off up the hill to Pont Cae Gors. Andy was not far behind. Alison and Nigel crossed the half way stage at 1:36 and 1:46 respectively. The rest of the race is tough as the hardest part is a gruelling, merciless 2 mile ascent from Waufawr to Bwylch Y Groes. Most runners walk this part as it is simply too steep too late when your legs are spent. Quite a few were being sick on the way up, fair play to them for keeping going. But what comes up, must come down. While a descent is normally something you look forward to, when your legs are cramped or your muscles have turned into slate slabs, the steep, technical descent (more like a fell run on slippery grass and rock) is in many ways more painful than the ascent and doing it in road shoes is tricky.